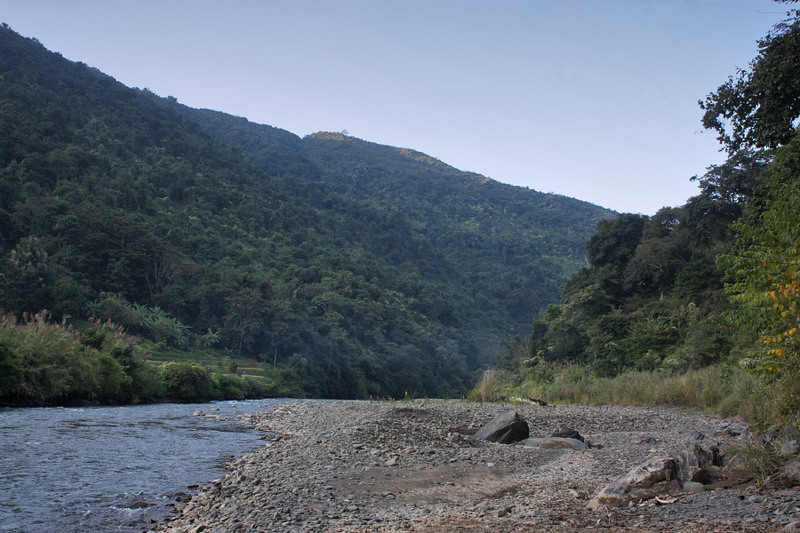 The Tizu river is part of the Community Conserved Area (CCA) declared by the village council which impose a complete ban on hunting and fishing. This was a case of illegal fishing and hunting in the designated 'Sukhai Conservation Area'. “Rules are rules; we shall definitely fine the offenders. The village council has set the rules and we all need to obey the same. Other villages should realise that we have completely banned hunting and fishing in our area and our decision should be taken seriously by them” were the words from a youth belonging to Sema tribe of Sukhai village from Nagaland, after they had caught people from the neighbouring villages fishing in their river. The customary rights of the communities in Nagaland are protected under Article 371A of the Indian constitution and the majority of the natural resources are owned by the local communities, village councils, district councils and other institutions. Hence, ownership of all the natural resources on the land of an individual remains with that individual. Communities mostly depend on natural resources for their subsistence, which includes agriculture, in the form of shifting cultivation (Jhum), timber extraction, hunting and fishing. In due course of time, the desire for improved living paved the way for overexploitation of these resources. Traditional equipment was substituted more modern equipment. Bows and arrows and traditional traps have been replaced by guns and modern traps for hunting animals, while fish baskets and nets have been replaced by batteries, chemicals and bombs for fishing. The thin line between sustainable and unsustainable eventually vanished. It was only in the year 2015 that the Sema communities of Sukhai, Ghukhuyi and Kivikhu villages of Sataka tehsil in Zunheboto dist. realised that excessive hunting, overfishing and reduced cycles of Jhum cultivation are putting the biodiversity in their area in danger. Hardly any animals or birds could be seen in their forests, or fish in their river. The River Tizu, which is considered to be the lifeline for Sukhai, Ghukhuyi and Kivikhu villages, as it provides them fish, an important part of diet of the villagers, was left with no fish bigger than size of a palm. The river also used to be the site where the villagers used to conduct community fishing, a unique practice of the Sema community, wherein people from the community gather and beat a root of a tree in a synchronised manner. The roots release a certain toxin which temporarily paralyses the fish, enough for the community to catch them for consumption. Such traditional practices used to be sustainable. The village councils realized that they had to take some serious decisions to restrict hunting and fishing to an extent. It is then that the communities in association with The Energy and Resources Institute (TERI) came together to devise strategies to conserve not only the rich biodiversity of Nagaland but also the associated traditional knowledge. This led to the formation of Tizu Valley Biodiversity Conservation and Livelihood Network (TBCLN) – a joint initiative undertaken by the 3 villages that has set aside a parcel of land of about 15 sq. km, known as a Community Conserved Areas (CCA). Rules have been set for the CCA as well as for the village area, which impose a complete ban on hunting and fishing. Anyone breaking the rules is to be fined heavily by the village council. The Peoplescape, Lifescape and information about the CCA was condensed into a one-of-its kind People’s Biodiversity Register (PBR) for the 3 villages of Nagaland. Selected people from the community were trained as guides for identifying birds and butterflies to help them secure livelihoods, as an incentive for their efforts towards conservation, which would help bridge the next step of conservation i.e. ecotourism in the area. Along with my colleagues Dr. Pia Sethi, Siddharth Edake and Vidhu Kapur, I used to regularly visit the villages to document the biodiversity of area. During my visit in November 2017, even though it is not the season for amphibians, we were lucky to find some species of frogs such as Indian Hylid Frog (Hyla annectans), Large Tree Frog (Rhacophorus maximus), Common Tree Frog (Polypedatus maculatus) and some frogs of Philautus sps. The croaking sound of Indian Skipping Frog (Euphlyctis cyanophlyctis) was still audible. We were on a mission to track and find the Hodgson’s frogmouth (Batrachostomus hodgsoni), a nocturnal bird species. The team consisted of 5 people, including me and the Chairman of Sukhai village. Unable to find the bird, we decided to walk till a bridge on the Tizu River and then head back to the village. After reaching the river, we found several people partying on the river bank. The villagers in our team explained that the river bank is a famous party spot for nearby villages. They still decided to check for known faces in the crowd and if any illicit activity was being carried out. The local members of our team called us after a long discussion with the party crowd. 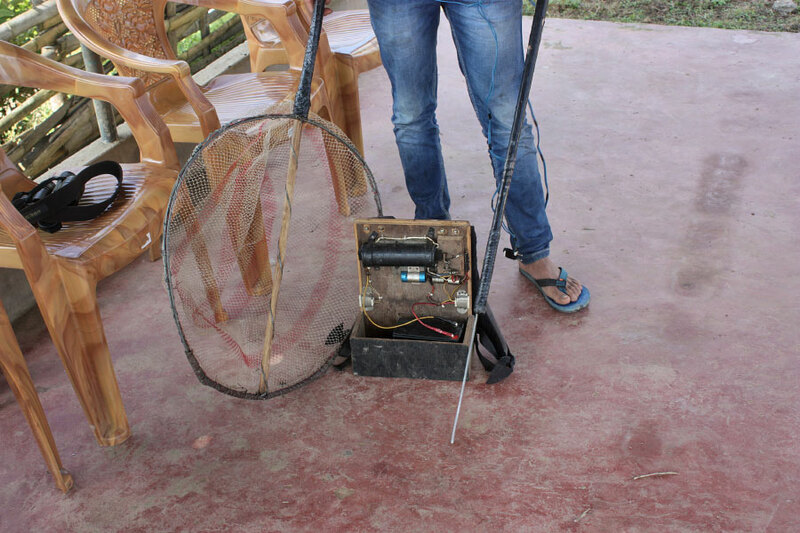 To our surprise they had found fishing gear which included battery based fishing equipment. They showed us dead fish in the bucket and a jar full of beetles collected from the river bank. This clearly indicated a case of illegal fishing and hunting in the conserved area. Some people from the party crowd were identified to be locals from the neighbouring village. All the equipment used for fishing was confiscated and the rules of the CCA were reiterated to them. The CCA committee have regularly advertised a circular stating ban on hunting and fishing to all the neighbouring villages, which was also prominent through the huge signboard put up on the bridge stating “Sukhai Conservation Area”. The party crowd was politely asked to be present in the village the next day so that a legal notice (summons) could be issued to them explaining what they had violated and the amount they had to pay as fine. This act put forth by the communities of Nagaland made me realise the sincerity and efforts that some of the community members are ready to put in towards conservation of nature. They share a unique relation with nature in which the give and take relation is well respected, as they have now understood the consequences of over-exploiting natural resources. This unexpected raid gave us an assurance that there is a way for the biodiversity to survive if the communities resort to conservation efforts in their village, which could be in the form of seasonal bans on hunting or promoting the use of traditional gear for fishing. Even though the Naga communities are traditional hunters, they have realised the importance of conservation of biodiversity for their own good. More and more awareness needs to be generated among the communities of Nagaland to ensure sustainable use of natural resources for a better future. Yatish is Associate Fellow, Biodiversity and Ecosystem Services, Forestry and Biodiversity Division, The Energy and Resources Institute (TERI).